Greetings on a Somber Friday morning. Please join us this morning in a moment of silence and prayer for the victims and those affected by the Japanese earthquake and tsunamis. Our hearts go out to them. Sometimes when tragedy strikes, it's difficult even to read the news reports, let alone watch video of the devastation. Our Planet is a restless and sometimes violent home for us humans. Natural disasters serve to remind us that we live at the mercy of Mother Nature and her vast array of destructive forces: earthquakes, tsunamis, fires, floods, tornadoes, hurricanes, volcanic eruptions, solar flares, cyclones, droughts, epidemics and epic blizzards. We often wonder what it would feel like to be near the epicenter of a powerful earthquake. It's a feeling neither of us want to experience. May God's Grace comfort those who are suffering from the world's 5th largest earthquake. We left Mesa not long after 9 am yesterday. We went to the Pro Ranch Market--a sort of a giant foodie COSTCO for Mexicans--to buy some chicken. We came out empty-handed as the type of chicken we bought the previous day had flown the coop. Traffic was tame (relatively speaking, of course) and we cruised over to 59th Ave. on the west side. We met a Zuki-head who sold us a Samurai carburetor for $30. We learned some neat stuff that will be on our Zuki blog soon. Then we headed back to 2nd Chance Ranch. Susun took a long and well-deserved nap while I unpacked and messed around with our assortment of stuff acquired in the Valley. I put together a First Aid kit for SuziQ. Now, doesn't that make you think of neosporin and band-aids? Nope. This is a first aid kit FOR SuziQ, not for humans. If you thought long enough, you'd probably think of everything that would be in such a kit. We'll save you the time. 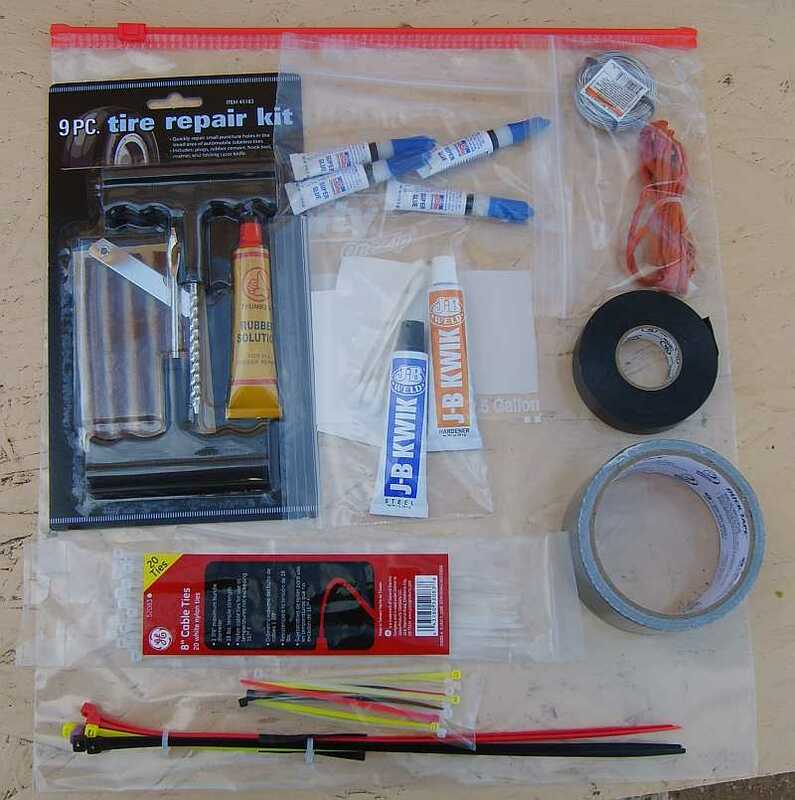 The contents include: duct tape, baling wire, twine, Super Glue, JB Weld, zip ties, electrical tape, and a tire repair kit. 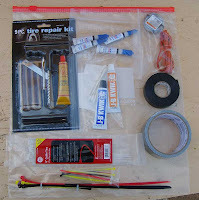 This first aid kit goes into the box of tools and parts that we carry on our back country road trips. We still need to add a spare alternator, fuel pump, and electronic engine control module to this box before it's totally trick, as the dirt bikers are wont to say. The weeds are once again totally out of control and way ahead of us. Our hot weather has caused them to explode. (It was 82 here yesterday!) We had to deploy our $500 wheeled weed whacker for a couple of hours late yesterday afternoon. At least they are now knocked back down for a day or two before their next spurt of spring grown occurs. 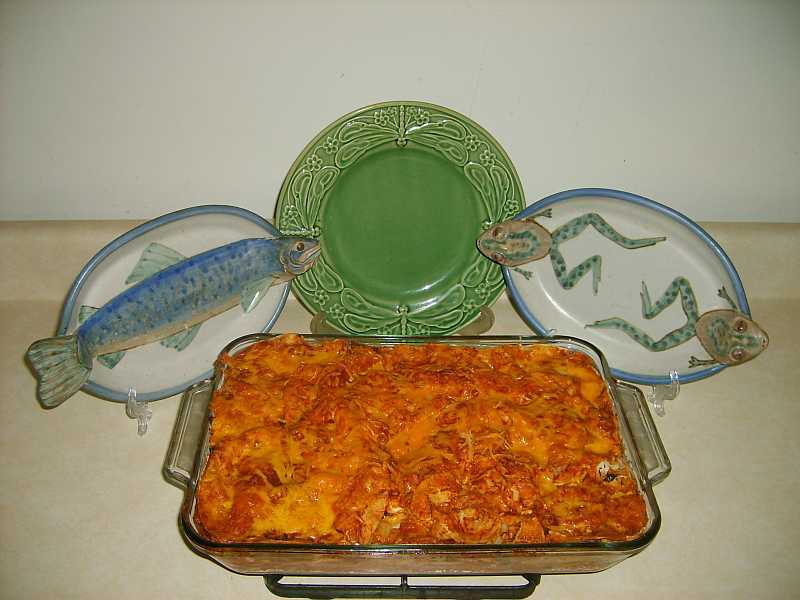 Susun put together a huge pan of chicken enchilada casserole and it made a fine repast following the evening campfire. Gary came over with his two Rhodesian ridgeback canines. We had a fun time visiting. We take so many photos it's hard to keep up with processing and posting them. Maybe we can get caught up this weekend. Today is a Chore Day. We haven't done laundry in more than a month so it's off to Cottonwood with a truck full of dirty clothes. While Susun toils away in the laundromat, I have to go meet Tom to talk pistols and such. He is working overtime to fine tune the custom 1911 gov't model .45 for me. The blog stats have dropped back to what we call "baseline:" a couple of dozen LBR's who visit each day and spend a couple of minutes looking at one or two pages. THANKS for reading! 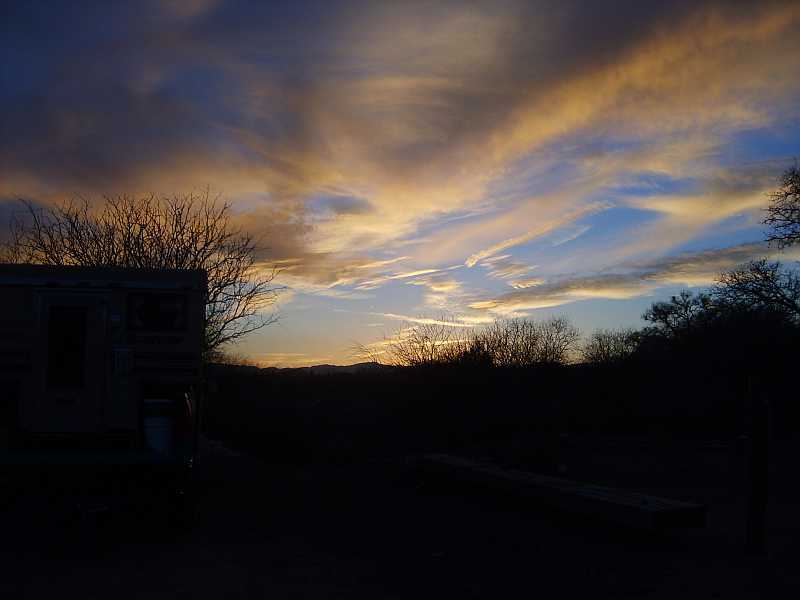 Beautiful sunset photo! Thinking and praying for those in Japan and all those affected elsewhere.